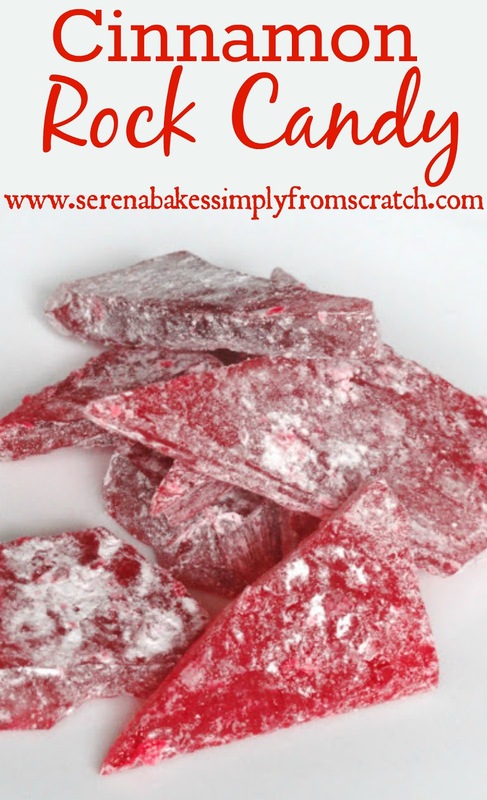 I learned to make Cinnamon Rock Candy after my husband and I became married. He has wonderful childhood memories of his Grandmother who would make this for him during the holidays as he grew up. She is such a wonderful woman and will be turning 100 in January! Simply amazing to me. So now I carry on her tradition for my husband and our own children of having the cinnamon rock candy! Make sure to use Cinnamon Oil. Cinnamon flavor will not be strong enough. Cinnamon oil can usually be found at craft stores or specialty stores with the candy making supplies. 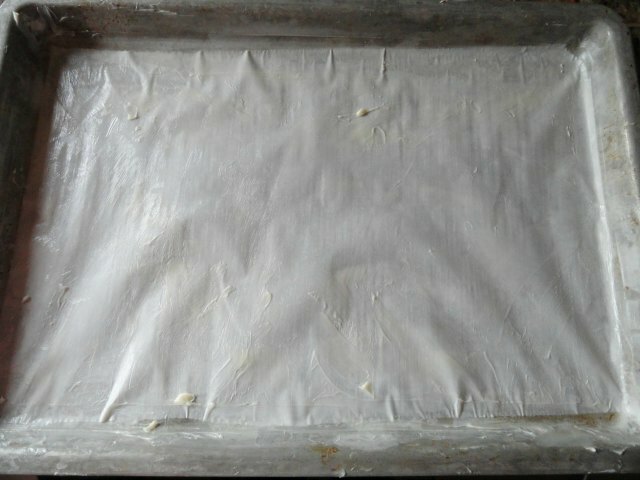 Grease a 15 inch x 10 inch x 1 inch cake sheet pan well with butter, then line with parchment paper and butter the parchment paper. Make sure to butter the edges very well to prevent the candy from seeping underneath. 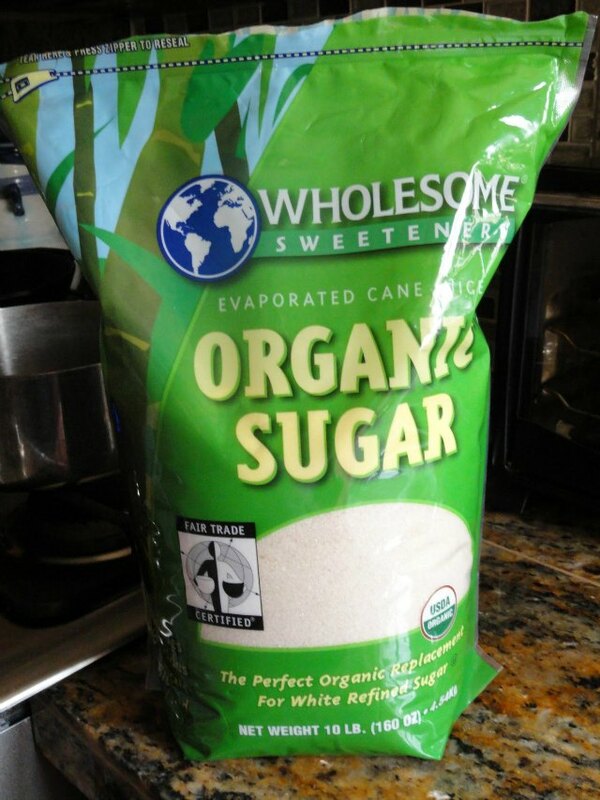 The huge bag of sugar for all the bake goods and candy I am working on! I keep a bowl of cold water next to me when I am working with boiling sugar just in case it is on my skin I can plunge my hand in real quick. Be careful the sugar is like hot tar. I have yet to ever get it on my skin but I figure better safe then sorry! 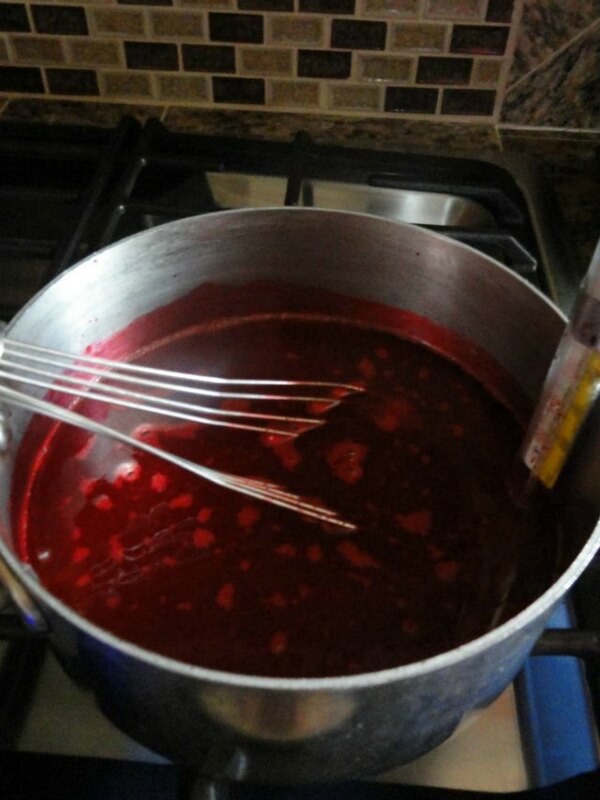 Mix water, sugar, light corn syrup and food coloring in a deep large pan. Whisk until sugar dissolves over medium high heat. Then attach a candy thermometer to the side, try to keep the thermometer from touching the bottom of the pan for an accurate temperature. I wish I would have used a deeper pan, I almost had a close call as it started to boil. I had to quickly remove it from the heat and whisk until it had subsided enough to not boil over. I then returned it to medium high heat. Cook until the sugar mixture registers 300 degree's on the candy thermometer. Remove from heat. 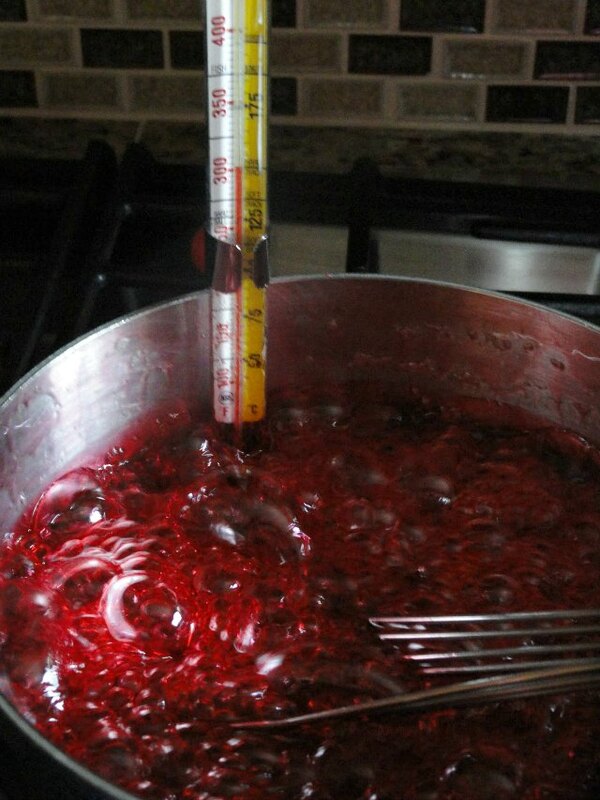 Remove thermometer and add the 1 teaspoon Cinnamon Candy Oil. Whisk in, working quickly. Tip: I keep my hood vent on and face away as I add it or it can feel worse then onions as it is very strong. 1 teaspoon makes a fairly mild cinnamon candy if you like yours hot feel free to add another teaspoon, I try to keep mine kid friendly. Pour on to greased baking sheet. Allow to cool for 4 hours. After 4 hours dust with powdered sugar. 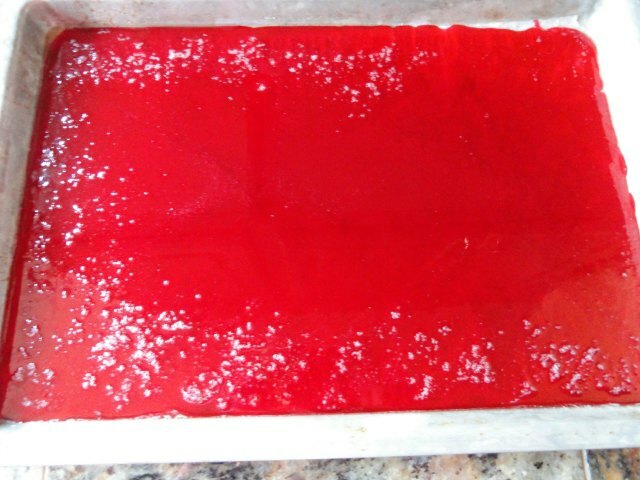 Flip candy out of the pan onto a large cutting board and remove parchment paper. Place back into cake pan. 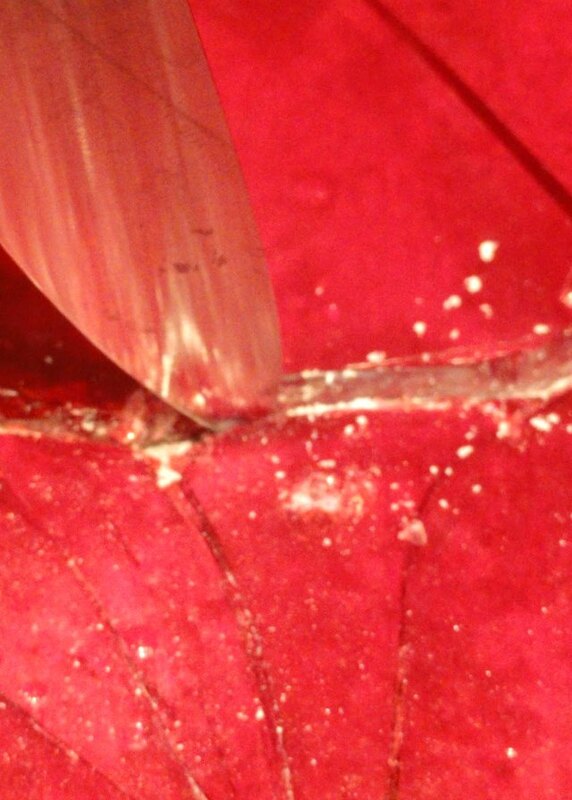 Use the tip of a sharp knife to break candy into bit size pieces. Dust the top of the candy with more powdered sugar and store in air tight container. Enjoy! Christmas Cinnamon Rock Candy recipe from Serena Bakes Simply From Scratch. A favorite for all holidays. Butter a 15 inch x 10 inch x 1 inch rimmed metal sheet pan. Line with parchment paper, and butter the parchment paper, making sure the edges of the parchment paper are well buttered to prevent the candy from seeping underneath. Do not use wax paper as it won't hold up to the high temperature of the candy being poured. 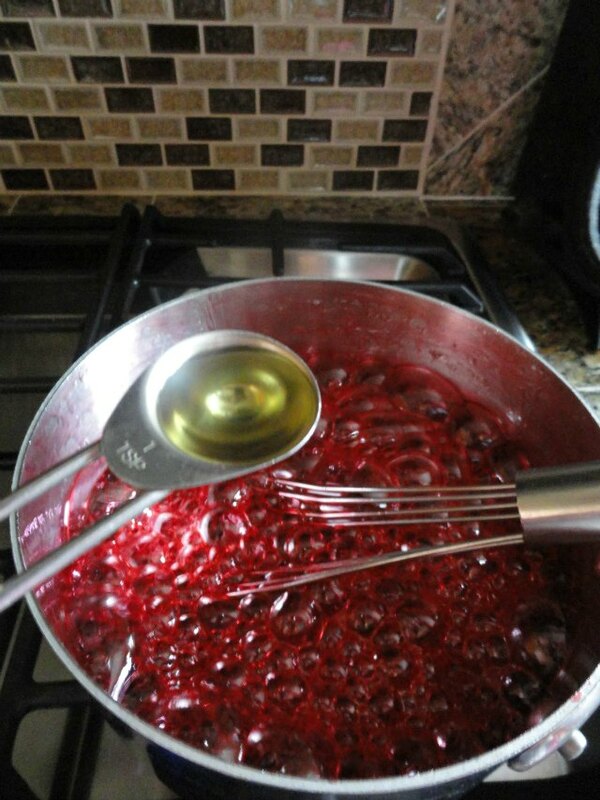 In a large deep sauce pan combine water, sugar, corn syrup, and food coloring. Mix over medium high heat until sugar starts to dissolve. Attach a candy thermometer to the side of the pan making sure it does not touch the bottom of pan for an accurate temperature. Continue to boil until sugar mixture reaches 300 degrees (hard crack stage) about 20 minutes. 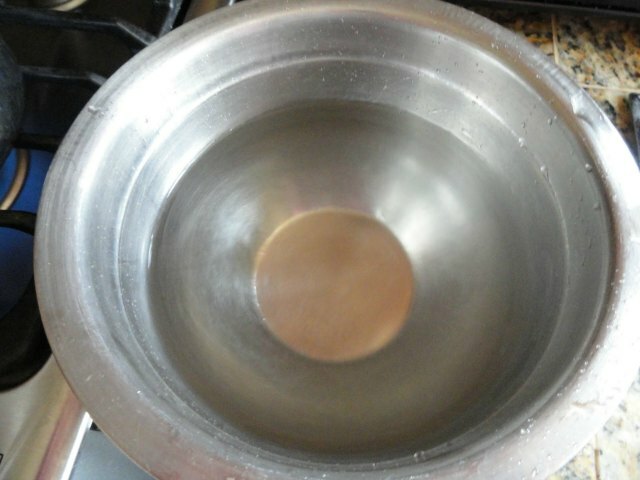 Watch closely, if mixture starts to boil to close to the edge of pan remove from heat, and stir until bubbles subside. Then return to medium high heat. It's better to slightly be over 300°F than under for candy to set properly. Once mixture reaches 300 degrees remove from heat and stir in the cinnamon oil, working quickly. Keep face away from the mixture as it is extremely strong, and keep area well ventilated. Pour immediately into prepared pan. Allow to cool for 4 hours. After 4 hours dust the top of candy with powdered sugar. Flip candy over onto a large cutting board or cookie sheet, and remove parchment paper. Return candy to the pan and use the tip of a sharp knife to break candy into bite size pieces. 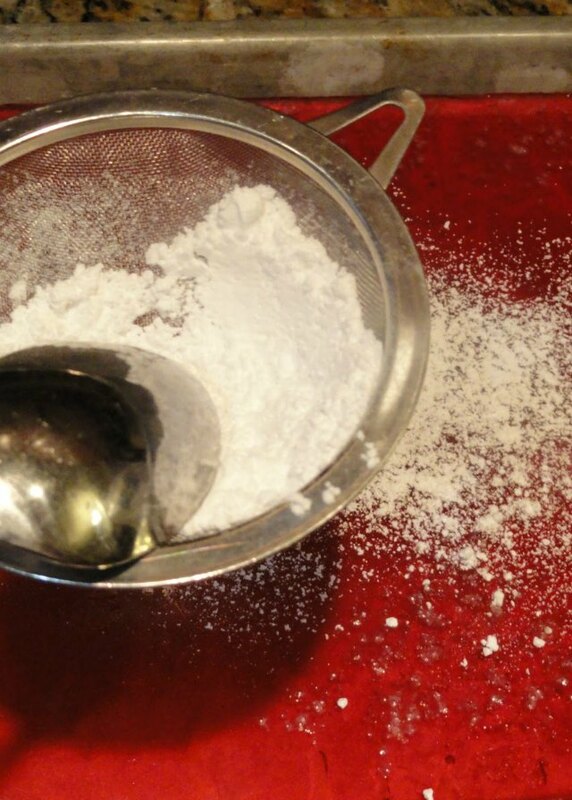 Dust with more powdered sugar and store in a airtight container. Make sure to keep a cold bowl of water near by incase any hot sugar mixture gets on skin. It is extremely hot, and will cause burns. I also recommend keeping children out of the kitchen while making, just to be safe. This definitely brings up memories - I love rock candy but never tried making it on my own. Thanks for the inspiration! If you want different flavors and colors use different flavor oils ex. bannana and yellow food coloring . 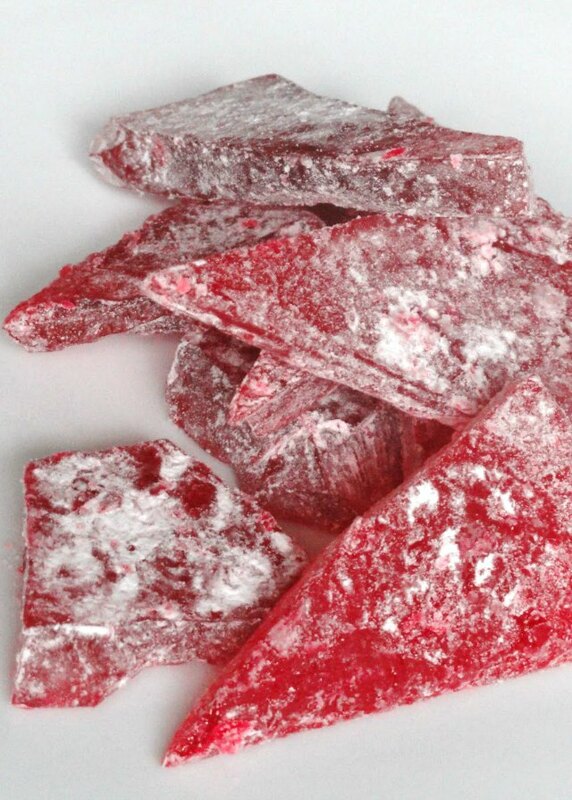 My grandma used to make this candy every christmas. We knew the holidays were close when we found this at her house. She never used a candy thermometor though. She just used a cup of cold water and would every little bit drizzle some in the water. When it made a cracking noise she knew it was ready for flavoring and would finish the recipie. It always worked. I now do it this way and never have any trouble. So if you dont have a thermometor perhaps try this. It should work. Awesome so the sound it makes... Does it sound the same as when you sprinkle water in grease to see if its ready? Hi Just curious as to whether this same recipe could be used with other flavor oils such as maybe peppermint, licorice(anise), lemon, or any berry flavor with appropriate food color to match??Thanks! Looks like FUN! My mom used to make this when I was a kid. Different colors & flavors too. She called it Sea Glass. I would come downstairs and there'd be a whole bunch of it on the counter. Yum! Would this work to coat an apple for candy apples? It would but I would only cook it probably to firm ball stage like 250 degrees for a somewhat sticky outside coating. We make this every year and use LorAnn flavoring oils. What quantité of LorAnn flavoring oils do you use? Most flavoring oils will be used the same way. They are much stronger then extracts. I would start out with a teaspoon for milder candy 2 for stronger. Candy flavoring oils are much stronger then extracts. Never heard about this ..Wonderful recipe serena..
Can you use ground cinnamon instead???? I love this candy. Thanks, going to try this weekend. Your welcome! Let me know if you have any questions. I just made it using a thermometer and it was so easy. It is delicious, I cant believe how strong the cinnamon is, it is winter and I need to open the ktchen window. My house zmelks great. Has anyone tried the cinnamon extract from J.R. Watkins sold at Walmart? Or cinnamon Bark from Dorera? 10 drops of Doterra oil was about perfect. It could go a little stronger if you wanted to. Thanks Shayna. I was wondering about using my DoTerra oil. Any ideas 5o keep it in? What is Hard crack stage mean? Looks like an excellent recipe to add to my Christmas baking list! Love cinnamon! I have found it is so much easier...take your baking sheet and parchment, put a layer of powdered sugar. Use your finger and make long indents from end to end. You can pour the hot candy into the indents. Even if it cools, it is already in the powdered sugar and you can just crack to the lengths you want. I have done this many times and it is the best way to make rock candy. Would any of the sugar substitutes work for this? I just made this rock candy and I used pure cinnamon extract by club house.I used 4 teaspoons and it came out just nice, was not over powering! Great recipe!!! This looks good. Who doesn't like the smell of cinnamon? How long can this store in an air tight container? I'm wondering why you butter the baking sheet before putting on the parchment paper? Is that to keep the parchment paper in place when you pour on the hot liquid? I made this candy in different flavors and gave it as Christmas gifts for my child's teachers. They all loved it. Big hit for Thanksgiving.. Asked to make it again before xmas..lol...have u tried like "sour patch "favor? Could you pour into silicone molds instead of "cutting" with a knife?? If using molds, do you have to butter them or spray them to get the candy to release? We just got some here at our office... it's not hot enough for me. So I'm on a mission to make this. I LOVE LOVE LOVE this stuff! I can have it year round! I'm trying it! Thanks for the recipe! I just made a batch per your recipe and I stirred into teaspoons of cinnamon oil For about 30 seconds. It looks like the oil has separated around the edges once I poured it into the pan on parchment paper. What did I do wrong? If you buy the 2 pack of Lorann oil there is the recipe for using the microwave and it's so easy and no need for thermometer. I make it every year for family and friends and everyone loves it. I pour it into a jewel molds that you can get at the craft store and it looks pretty. I make about 70 batches of different flavors. Great gift to give to a lot of people. My candy stuck to my wax paper! I buttered it and still have no idea why!?!? I so want to try this! This would make such lovely holiday presents! This is so fun for the holidays! Love it!! Kids won't get enough of these!! Such a fun treat and really easy to make! Such a fun holiday candy! And so easy to make! Making this for the second time tonight! I bought other flavored oils, but cinnamon is my all-time favorite! Easy and delicious...thanks for sharing your recipe!